Make the morning commute a little easier by promoting the travel mug at fundraisers! The mug featur..
15 Oz. 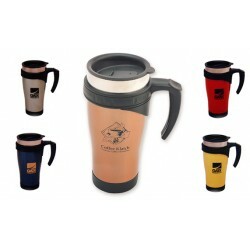 Designer Stainless Steel Commuter Mug w/ Open Handle, Colors: Green, Yellow, Copper, Black ..